As it was rather chilly this morning, I wasn’t tempted to linger and wake up slowly. When the alarm went off, I immediately made my morning trip to the bathroom, and then came back and crawled into the sleeping bag and started packing stuff away. Whenever we spend more than a night in the tent, all kinds of stuff invariably ends up in there and needs to be put in its appropriate place so it can go back in the panniers. Laptop has to go back into its protective sleeve and dry sack, kitchen stuff has to get put back in the kitchen bag, the stuff that got removed from my tank bag has to go back, have to deal with the clothes bag, etc. All this stuff takes a surprising amount of time, and it was cold, so the logical thing is to do all of this from the comfort of a sleeping bag. Also, Kay totally didn’t warn me that I had crazy hair this morning. I’d gotten so cold in our tent last night that I slept with the Cyclone Buff pulled over my head in a balaclava, and my winter hat on top of that – and when I went to the bathroom this morning my hair was utterly crazy. I was embarrassed about the crazy hair when a woman from the campground came over and tried chatting with me about the bikes. She was using Spanish that we don’t know, so it wasn’t a very successful conversation, but she smiled at us and seemed pleased by us being on motos. She didn’t seem to mind my crazy hair. Unfortunately, with all of the COLD this morning, we had to add back in all of our cold-weather layers that we were so happy to shed the other day. Rain liners back in our clothes, heated jackets back on and winter gloves back out. We were sad to have to be putting this stuff back on, but definitely wanted it because it was chilly riding out. 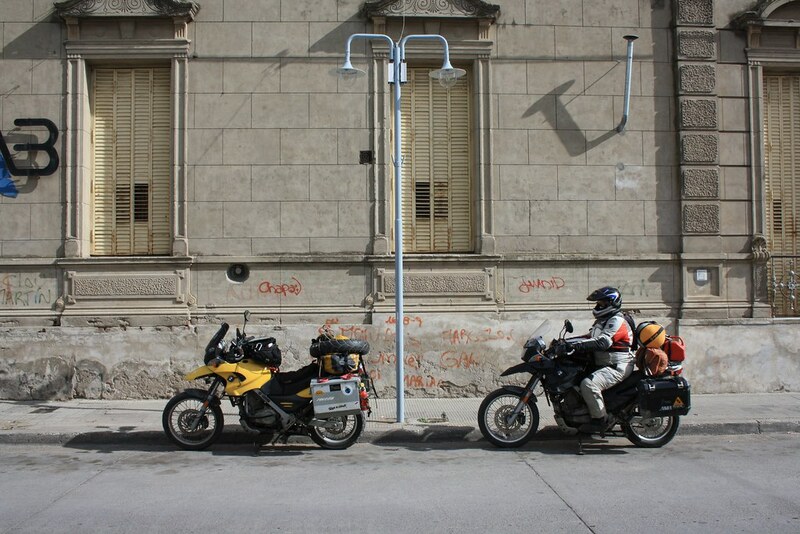 First task of the day was to get back into Viedma, where we’d pick up Routa 3 again, and find gas and an ATM. Time for more money. Gas was easy, but we asked a guy at the gas station who came over and chatted with us (in English!) about an ATM, and he gave us slightly wonky directions. We ended up missing our turn and going over a river, and then not being able to get to a bridge back across the river… I finally asked (insisted) that Kay stop at the gas station we saw and ask directions to an ATM over here. These directions were accurate, an ATM was located and money acquired, and we made it back to Routa 3 with a minimum of fuss. Except now it was 11AM already, and we hadn’t even left town. Luckily we’re not in a particular rush to get to Buenos Aires, and had no destination in mind when we left, but it was still a later-than-usual start considering we skipped most of our usual morning routine. Back on the road. More boring riding, although I felt it was a little less boring after our day off. The landscape changed to a bit of scrubby grassland with small rolling hills, which was more interesting, although our helmets instantly became covered in bug splats. And then the landscape changed again to quasi-farmland. We loved the green smell, but couldn’t figure out how they were farming because the ground we could see looked like sand. Tried stopping at a YPF for gas and lunch shortly after 12PM, as we were both starving from not having breakfast and last night’s lame dog-rejected pasta dinner, but it didn’t look like it had a restaurant or even cold sandwiches, and we both wanted a warm lunch. So we continued down the road to the next town, where I knew Joe and Vern had stayed when they went north and assumed we’d find gas and maybe a restaurant. We did find a gas station that served food, happily. Kay got a hamburger, and I got the lomito completo that I’ve grown to like so much… except mine came not on a sandwich, but as a platter. And I liked it even better than the sandwich. The fries were also surprisingly tasty. In all, lunch was a complete success, even though we both had things we’ve been eating a lot lately and are starting to get tired of. It felt like a feast after no breakfast and last night’s lame dinner. Kay’s note: there’s really not a lot of choice on the menus we’ve been encountering: hamburger, lomito, milanesa(sp? ), and maybe, if you’ve been very good, and brushed your teeth, chicken, with fries because you couldn’t possibly want anything other than fries with your food. Back on the road after lunch, and more boring riding. We both kept getting random songs stuck in our heads, and updated each other periodically about what song we were stuck with, occasionally singing along together. Eventually the speed limit went down to 80KPH, and we kept going around 100-110KPH because that’s what we’ve been doing for weeks and we didn’t feel like we’d get anywhere going 80KPH (not quite 50MPH). And the Argentinians on the road were passing us like we were standing still. Apparently going 110KPH in an 80 isn’t fast enough for people down here. I definitely felt like I was driving in Latin America today. The passers were cutting it far too close with the oncoming traffic, which was particularly nerve-wracking when WE were the oncoming traffic and cars were barreling down our lane the wrong way towards us at 110+. Not much else to report. During lunch, we’d decided we should shoot for Tres Arroyes as our stop for the evening, which is about 300 miles from where we started and 300 miles from Buenos Aires. I would have liked to make it a bit further so we wouldn’t be heading into BA at the end of a lengthy-ish day, but we didn’t know how far it would be to the next town that had a hotel and didn’t want to get stuck bush-camping in case it would be too cold. Plus we both stink from not showering the past couple of days whilst camping, and were looking forward to a warm shower. So we check a couple of hotels in Tres Arroyes, find one (Casino Hotel) that has a reasonably decent price (for Argentina) and a hotel, and stop for the day. Turns out there is an actual casino behind the hotel, which we wandered into looking for soda I could buy. We both agreed that the machines in the casino seemed lame – it’s just like sitting at a computer punching buttons, and we didn’t want to waste any pesos gambling there. Couldn’t get anyone’s attention to buy soda, so we went out to the main street and saw a YPF just down the way. Headed in that direction and it turned out to be the biggest YPF we’ve seen yet, with something like 8 or 10 lanes for gas and diesel and a full-on cafe with a large seating area, as well as the usual munchies. We decided to skip the casino restaurant and grab some sandwiches while we were here, and also ended up grabbing some croissants, which amused me. Just found out about your trip/blog a few days ago and I wanted to say that I’m insanely jealous! Looks like you two are having a lot of fun and your 10,000 mile video update reminded me of why I (we) do these crazy things. If you’re heading back through Philly and need a free place to stay and safe garage for the bikes drop me a line. I live near Revzilla (but in a nice part of town! ).